A dramatic and moving story of the effects of Hurricane Katrina on the people of New Orleans as seen through the eyes of a ten-year-old boy. It is August 2005, and a hurricane is headed for the Gulf Coast. But ten-year-old Louis Daniel and his family aren't worried...not until the wind starts banging down the door. As the water begins to rise, Louis grabs his trumpet and the family races in search of higher ground. I don't think anyone can ever understand what it would be like to live through a natural disaster, unless you have been there - in this case, a hurricane. Hurricane Katrina is an event in our nation as one of the most catastrophic and expensive natural disasters in history. Its hard to believe that this August will mark the 6 year anniversary. The book focuses on one fictional family, and their story of courage, love and devotion to one another during such an unhappy time. It truly was a scary, unpredictable and awful situation that so many people had to go through. I have to share that the ending was really good...and I love the little dog in the story! As a teacher, I would recommend this book for middle to upper elementary school aged children through high school. 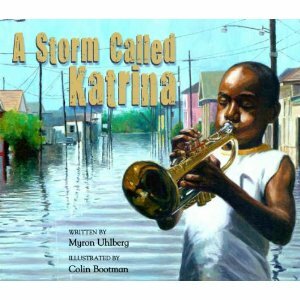 The last few pages of the book provide resources all about Hurricane Katrina, including books, websites, dvds and more. There needs to be more books out there like this one to discuss other horrific events in our time, at the level/understanding of children, like September 11th, 2001. I remember when I was teaching - I could not find any books that were kid-friendly to discuss 9/11/01. I don't want my children to not know about it, and pretend it never happened...or events like when the Shuttle fell, or the holocaust. I realize these events are not "natural disasters", but what I am trying to say is that bad things happen and children should be able to have learning tools, such as picture books to explain. I know its easier said than done...how would you tell your children about an event like Hurricane Katrina, Sept. 11th, or most recently the tsunami in Japan? Have you talked to them about it? I know my girls are too young...but someday they will ask questions and I know I would like to be prepared. Each day this week, I have woke up to another article/news story about the devastation in Japan and thousands of people who died. I don't want to even imagine what they are going through..no food, water, heat, clothing, shelter for more than 3 days. I saw this post on facebook from another friend...Sept 11th (NY) Jan 11th (Haiti) and March 11th (Japan).. Weird. Luke 21:10-11 Then Jesus said to his disciples: "Nation will rise against nation, and kingdom against kingdom. There will be great earthquakes', famines and pestilences in various places, and fearful events and great signs from heaven. 'Jesus says for behold I come quickly,' ♥* [so ask Yourself are you ready?] ~ Wow! I never realized that all three of these events were on the 11th. This book will be available for purchase on Amazon in late summer (avail. August 1, 2011). Thank You so much Net Galley and Peachtree Publishers for allowing me to read this book! I cannot wait to read more books from you in the future!